Love animals and want to make sure that they're around for future generations to appreciate them? When you support the WWF, you're helping to safeguard the future of some of the world's most beautiful animals for generations to come. Stop by the WWF online shop and you can pick up some fantastic gifts and contribute towards the Fund's good work. And with a WWF promo code, you can save money while you shop. Founded in April 1961, the WWF is an international non-governmental organisation that works to promote conservation, research and restoration of the environment. Initially a fund dedicated purely to supporting endangered wildlife – known as the World Wildlife Fund – the organisation gradually evolved to cover wider areas of conservation and preservation. In 1986, the WWF changed its name to the World Wide Fund for Nature – keeping the same acronym – and today the organisation works in over 100 countries supported by almost 5 million members around the world. Combining global reach with a solid foundation in science, the WWF works to deliver innovative conservation solutions around the world which meet the needs of both people and nature. Their mission is to conserve nature and reduce the most pressing threats to the diversity of life on earth, and to these ends the organisation supports and organises hundreds of projects at every level from local communities to governments and business stakeholders. The WWF aims to educate and influence people into making sustainable choices and decisions, whether they are those working with natural resources or people setting policy that impacts on nature. At the WWF's website you'll find an exciting range of products and services that you can purchase to support the amazing work of the organisation. Always had a soft spot for tigers, elephants, pandas or penguins? What about slightly more unusual animals like the three toed sloth or the fennec fox? All these and more animals are available to adopt under the WWF's species adoption scheme. Buying a scheme gets you a certificate, a photo and a stuffed toy, as well as the knowledge that you are helping these beautiful animals to survive. The website also stocks a wide range of gifts and clothing, all of which help to raise money for the WWF's important work. Want to get shopping with WWF? At the WWF online shop you can find the perfect gifts for the animal lover in your life – or something special to treat yourself with. And with a WWF discount code, you can even make great savings while you shop. Browse our website until you find a WWF promo code that's right for you, then navigate to the WWF online shop to begin browsing. Enter your WWF discount code in the box provided. Want to find out more about the amazing work of the WWF? Why not check out their dedicated YouTube channel? You'll find lots of exclusive content including unbelievable behind the scenes nature footage, documentaries, information on WWF projects and more. You can also use this channel to find out more about saving money with a WWF promo code. If you've enjoyed buying beautiful gifts for your loved ones and helping to save the environment with WWF, why not see what other gifts you can find at buyagift.com or treat someone special to a lovely bunch of flowers from bunches.co.uk? Or, if these aren't up your street, you'll find plenty of other stores in our Flowers and Gifts section. Navigate to the WWF online shop to begin browsing. Fill in your name and address details and click 'Proceed to next step'. WWF offers free global shipping on all their gifts and products. Need to contact the team at WWF? Whether you have a question about your purchase, want to find out more about the fantastic work being carried out by WWF or just want to find out how you could save money with a WWF promo code, you can contact the Customer Services department by telephoning 0844 736 0036. Want to discover more about what's happening behind the scenes at WWF? The company maintains a profile across all your favourite social media networks. Follow them for all the latest wildlife and environment news, updates on adopted animals, competitions and more. 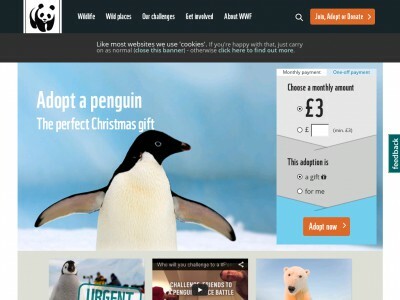 You can also use this page to find out more about saving money at the WWF online shop. Don’t forget to check them regularly, as you can never be sure when a free WWF promo code might be waiting for you! Buy now online at www.wwf.org.uk. My young daughter absolutely adores tigers, and loves to visit them at the zoo. She cares about conservation too, so we knew something from the WWF would be the perfect birthday present. At the WWF online shop at support.wwf.org.uk, you can get great discounts on a range of animal-friendly gifts with a WWF promo code. We used our WWF discount code to get a fantastic deal on a Bengal Tiger adoption pack complete with cuddly toy! So if you've got animal-mad kids in your life, see what you could save with a WWF promo code.